The offshore wind industry received a significant boost this spring with the dual announcements: firstly, the political agreement and action plan by North Sea countries on closer energy cooperation particularly in relation to offshore wind, and, secondly, a commitment by 11 of the leading energy companies that offshore wind can achieve a cost of €80MWh by 2025 given that the right policies and international co-operation are in place. These announcements set a target for the industry and provide the long-term stability for achieving that target. Thus, the requirement for achieving cost reductions is as strong as ever and this is good news for LEANWIND as there is a real appetite for the innovations being developed in the project. Much of the LEANWIND work is now well advanced and each technical workpackage has developed either new technologies, design tools or models that will achieve cost reductions or help develop niche markets. The focus going forward will be to validate the benefits of the LEANWIND innovations and communicate them to the wider industry. Already there are a number of workshops planned to disseminate the LEANWIND output and I would encourage attendance of these events. Also, we will be releasing more information about the project innovations through public fora and publishing scientific papers to ensure maximum impact of the work. LEANWIND set out with a very broad and ambitious work programme and it is very satisfying to see the project goals being achieved. applicable and beneficial to the industry in the short to medium term. Thanks to the support of the LEANWIND project, GDG have committed significant research resources to optimise offshore wind farm construction, deployment and decommissioning. Leading a group of consortium partners composed of offshore operators, project developers, contractors and O&M experts, they are developing novel new foundations concepts and enhancing existing foundation solutions. Offshore monopiles appear to dominate the wind farm sector at present, with many developers promoting their use for upcoming projects and an industry trend for larger diameter monopiles in deeper water. The benefits of leaner and more efficient design approaches are clear to the entire industry, leading to significant CAPEX cost reductions. GDG Managing Director, Paul Doherty, stated that “having recently implemented these new design approaches on offshore wind projects in the North Sea, we have seen these savings in practice, with the steel tonnage reducing by over 20% below the mudline”. The GDG team have a wide experience base including geotechnical expertise, structural modelling and maritime engineering, which has been further enhanced through involvement of key staff members in joint industry projects such as the PISA monopile project led by Dong. Over the next five years, as we strive for cost parity with conventional sources of energy, these optimised monopile design methods have a critical role to play. The investigation on Gravity Base Foundations (GBFs) has been mainly aimed at improving the feasibility of buoyant concepts. The focus of this research has been on the detailed design of novel concrete structures, including geotechnical, structural and hydrodynamic analysis. Its output has shown concrete gravity structures to be viable in specific site conditions. A suite of parametric studies have also been undertaken to define the optimum geometric configurations for buoyant gravity structures – this is particularly useful to assist in FEED stage engineering design. 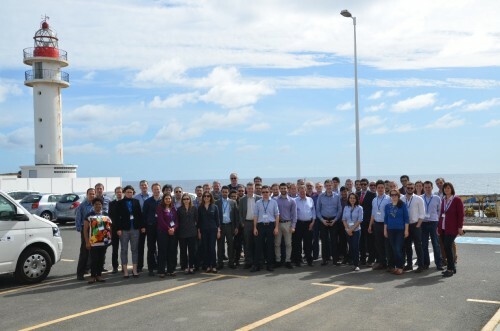 In addition to the work undertaken within the LEANWIND project, GDG have been involved in the EDP led DEMOGRAVIT3 consortium which is currently in the detailed design phase of a novel concrete hybrid structure which will be deployed in Portugal next year. When commissioned next year, the DEMOGRAVIT3 project will be the first fixed structure deployed with the turbine pre-installed! 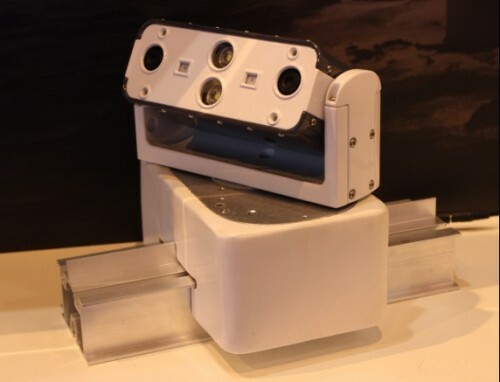 The remote presence solution developed within LEANWIND by NA.AS is intended to be a low-cost method for checking the status of wind turbines to better know their condition and support decision making. Although useful for all turbines, this is especially beneficial to offshore turbines where reducing the need to travel to the site to do inspections are costly, time consuming and weather dependent. The system consists of an instrumentation platform that moves on a rail installed inside the turbine and observe it on behalf on operators on land. Information can be gathered while the system is remotely controlled by an operator on land, or automatically without human intervention. 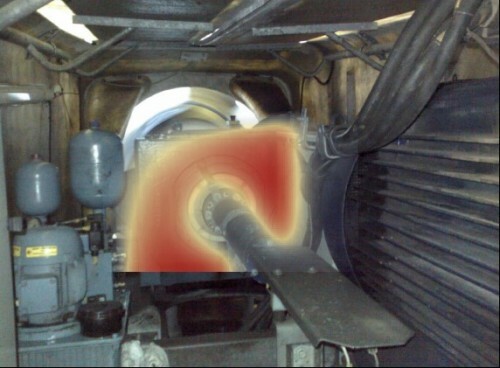 Existing condition monitoring systems typically measure vibration, temperature and performance data. Remote presence have a different approach, and focus instead on information similar to what an operator on site would observe, e.g. video, sound and thermographic imaging. A pilot installation of a stationary version of the system was performed in June of 2015, and ran for 6 months. A new test with a fully featured version of the system, shown in the picture below, is planned for autumn of 2016. This will be installed on a rail inside a turbine, and operate similarly as a commercial product. The final cost of energy produced by off-shore wind farms can be reduced by rendering the whole logistics system more efficient throughout the wind farm supply chain lifecycle – from installation and O&M to the decommissioning phase. The use of lean principles will help in defining the key industry challenges, analysing the separate parts composing the offshore wind supply chain – such as on-land transport and ports- and optimising them. A Full logistics model demonstration, including a demonstration of the GIS database, and Models for ports suitability assessments will be presented on 8 September at the first Stakeholders Showcase event, in Oostende. For more details, please see the “Key Events” section below. 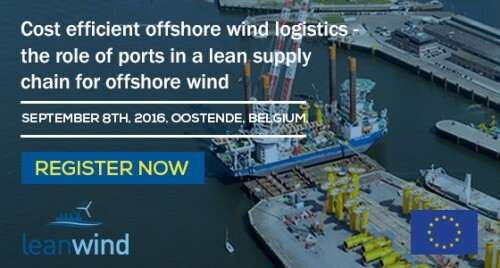 This 1-day event will take place in the Hotel Andromeda, Oostende, Belgium, and will showcase how ports can contribute to optimising the supply chain for an offshore wind farm. Notably, it will present project work to improve on-land and port logistics as well as innovative turbine and foundation installation strategies. One of the highlights of this event will be a presentation of the experience of transformation undergone by the Port of Oostende, which has vowed to becoming the Flemish service port for the blue growth economy.More details on the event agenda. 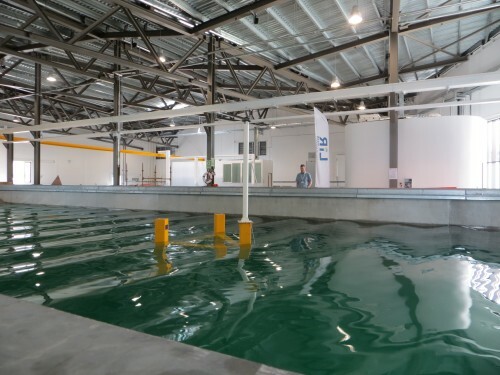 A boat tour of the port installation, training and O&M facilities (14:40-16:30) will allow the participants to get a little taste of the functioning of an offshore wind park and concretely evaluate the added vale it can bring to harbour authorities and the local communities. For logistical purposes, we would appreciate it if you could register. As part of the WindEurope Summit 2016, this session will present an analysis of possible positive and adverse environmental and socio-economic impacts that the application of “lean” principles in the offshore wind farm lifecycle and supply chain can generate on local environment and communities. It will also provide the case study “Port of Oostende” to highlight the role ports play in a local community and show the challenges and rewards of port insertion in a lean offshore wind supply chain.Finally, the session will present the progress of the more holistic economic model the study will convey to. This aims to assess both the possible costs savings deriving from the novel approach applied and the industry uptake of the innovations generated. Please be aware that access to the event is only possible if you possess a one-day pass for the WindEurope Summit 2016. We would appreciate it if you could notify us your attendance by filling in this form. The IAG consists of representatives of: Statoil (Norway), Statkraft (Norway), Siemens (Germany), Senvion (Germany), The Crown Estate (United Kingdom), Mainstream Renewable Power (Ireland) and DNV Kema (Norway). Do not miss our upcoming publications!